In the last post on Asphalt 9 Legends game, we shared a detailed guide along with a bunch of tricks, tips & cheats(you can read that post here). And in this post, we are going to share a brief guide on blueprints & trade coins. So let’s get started and learn how to sell blueprints or car’s cards and earn trade coins. And how to use trade coins to grab precious & premium cards. Trade Coin is one of the in-game currencies featured in Asphalt 9 Legends that can be used in the shop -> legend store to acquire or purchase premium cards of premium cars. The player can earn trade coins by selling blueprints. You get blueprints or car’s cards by completing the stages in my career or as a reward upon completing the missions. You can learn about cards here. 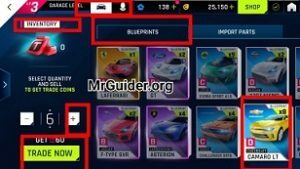 Let’s learn how to sell blueprints or car’s cards in Asphalt 9 Legends game! How To Spend Trade Coins In Asphalt 9 Legends? Go to the shop menu. Head to the legend store(shop -> legend store -> get now). Swipe left to check out the deals. Don’t waste trade coins to purchase uncommon cards. It would be better to buy rare cards. Keep in mind that you should not sell the blueprints of that car which you use the most. Sell only useless car’s cards. This feature gets unlocked after crossing level 5(reputation).